Cambodia’s capital, Phnom Penh, is a city of over 2 million that includes thousands of expats from all over the world. Once called the “Pearl of Asia,” the city has a rich Indochinese and French architectural and cultural history that provides a fascinating backdrop to the city’s bustling activity and growth. For the first-time English teacher newly abroad, Phnom Penh offers a wealth of attractions and comforts that can help ease the transition into a brand-new world. Whether you’re holding a newly minted TESOL teaching certificate or you’ve been teaching English as a second language in the United States for years, Cambodia’s largest city, Phnom Penh, is an ideal choice if you’re thinking that you want to teach English in Cambodia. Not only will it provide an unforgettable cultural experience, but the expat community there is also large and vibrant, which can make being away from home a little easier. If you’re hoping to travel the globe as an English teacher but want to ease into becoming a citizen of the world at your own pace, here are just a few reasons Phnom Penh is particularly amenable to that goal. Most of Cambodia’s expatriates live in Phnom Penh, which gives the city a remarkably cosmopolitan feel. Expats from the U.S., the United Kingdom, countless Asian countries and Europe all live and work within the city. Roughly half of those teach English or work for NGOs (non-governmental organizations), while the other half work for international businesses. Because of the high percentage of expats in the city, not speaking and reading Khmer won’t slow you down at every turn, although learning the language would be beneficial if you really want to experience the city and culture over the long haul. Many locals speak more than passable English, which means you’ll be able to maneuver your work and life without too much trouble. The other primary advantage of the large expat community has nothing to do with the language, however. It means you can find a community of people whose experiences of the world and Cambodia are similar. Not only will this opportunity help alleviate homesickness when it arrives, but developing friendships with other expats will help you learn the ropes in Phnom Penh faster than you’d learn them on your own. Whether or not you’re a history buff, you should be aware that the United States’ involvement in the Vietnam War directly affected the people of Cambodia considerably. Because the North Vietnamese had bases of operation in the country, the South Vietnamese and the United States mounted a series of campaigns in an attempt to guarantee South Vietnam would be secure once the United States’ military left the region. These efforts plunged Cambodia into a bloody civil war between the Khmer Rouge and the Cambodian government that left between 200,000 and 300,000 dead, and Phnom Penh’s inhabitants suffered greatly. Numerous festivals, music and arts events take place throughout Phnom Penh all year long to celebrate the history, culture and diversity of Cambodia. The city also has two noteworthy museums that will grant excellent insight about the city and region to any visitor. 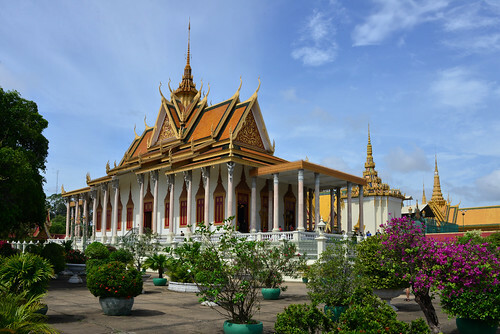 The National Museum is Cambodia’s largest and most important historical and archaeological museum, and the Toul Sleng Genocide Museum — a former Khmer Rouge prison—tells the story of the cost of the nation’s civil war. Additionally, the food, architecture, markets and temples all create an atmosphere that is vibrant and fascinating and wholly unlike any other. Unlike many developing Asian cities, Phnom Penh has more than its fair share of amenities to please a first-time English teacher from the U.S. Countless English-style pubs, run by English-speaking expats, are scattered throughout the city, and there are plenty of coffee shops, too. Two new, air-conditioned movie theaters were recently built, and for getting around the city, the tuk tuks — open-air, covered carts pulled by local drivers on motos — are a great way to get around. Just be sure to negotiate a price before you hop in. There is no standardized pricing for travel in Phnom Penh, and tuk tuk drivers are notorious for taking advantage of unwitting foreigners. If you are able to negotiate the price in Khmer, you’ll get a better price, which is yet one more reason to learn the local language. Teaching English in a distant land is a great way to experience another culture, while drawing a paycheck. For the first-time teacher whose experience abroad is limited, Phnom Penh provides an exciting and expat-friendly lifestyle that will make the transition away from life in the United States a little easier to handle.